I came across this recipe online sometime back and have been wanting to give it a try but never got a chance. I finally gave it a try with coconut dosa and I loved the combination. The chutney doesn't have any unique taste or flavor. 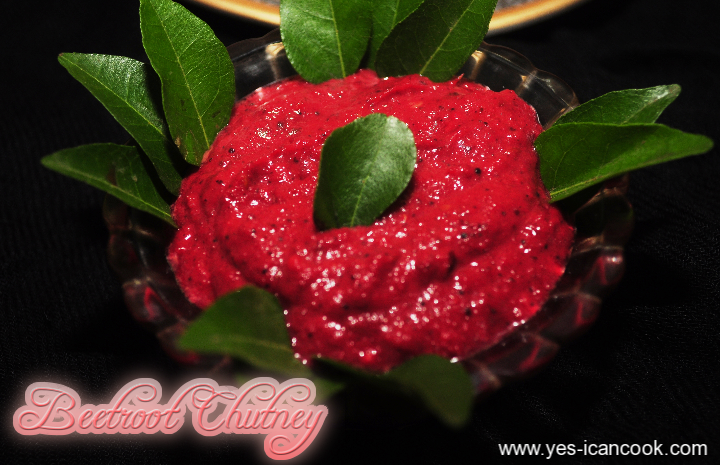 It's a tasty and simple chutney and the recipe itself is unique as I have never come across a beetroot chutney before. 1. In a cooking vessel heat oil. Add mustard seeds and when they splutter add cumin seeds. 2. Add dried red chillies and curry leaves. 3. Fry for a minute and add urad daal and chana daal. 4. Fry till the lentils turn golden. 5. Add the chopped onions and fry till they turn translucent. Add coriander leaves. 6. Add the chopped beetroot and fry till it is cooked. Add water if needed. 7. Once cooked switch off flame and let it cool down completely. 8. Transfer the contents to a mixer and grind to a smooth paste.